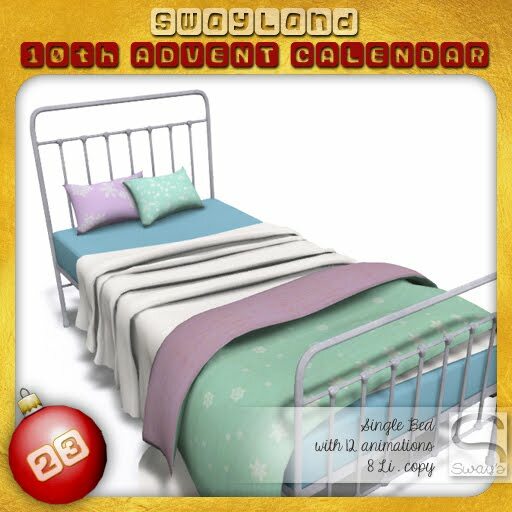 Maybe some of you remember this gift from one of the last Advent Calendar. 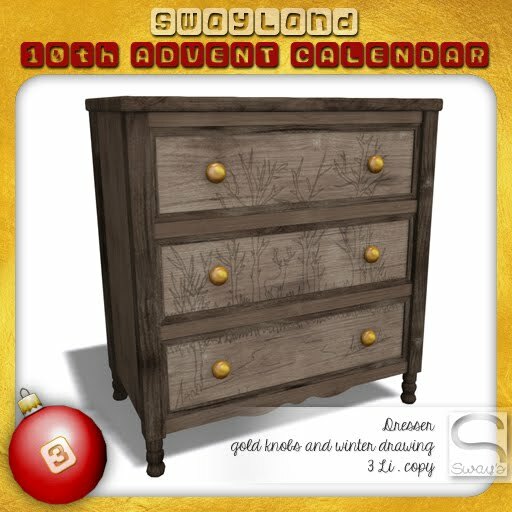 It's my favorite Friday on the month. Fifty Linden Friday! 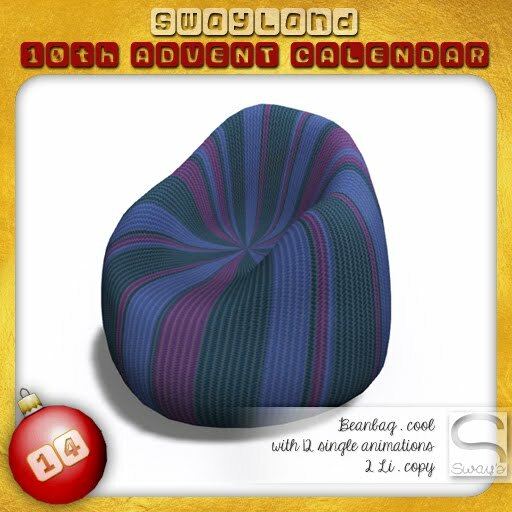 Maybe some of you remember this gift from last year. 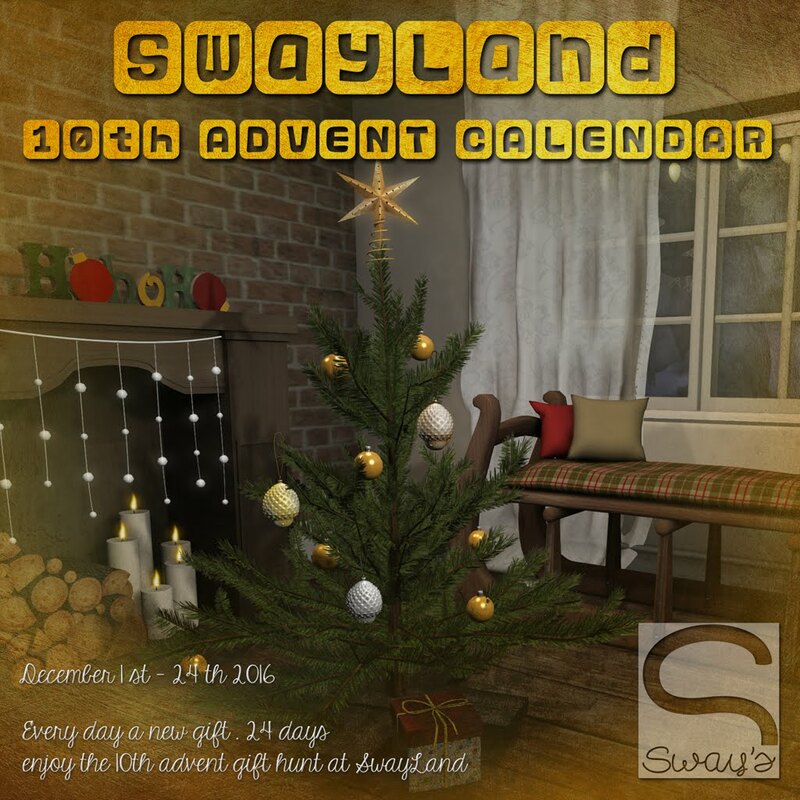 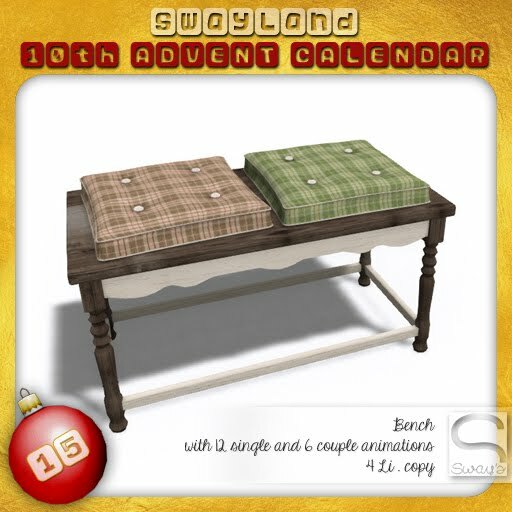 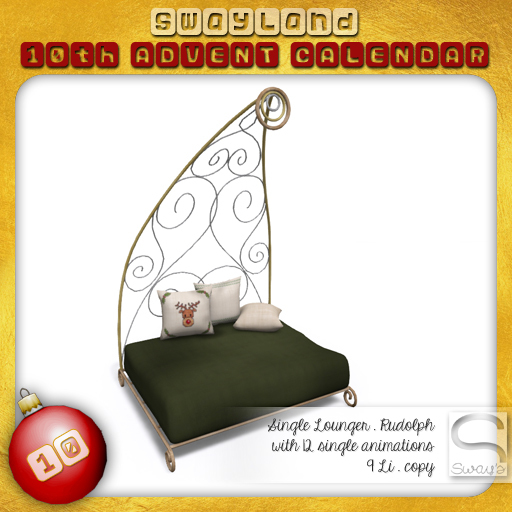 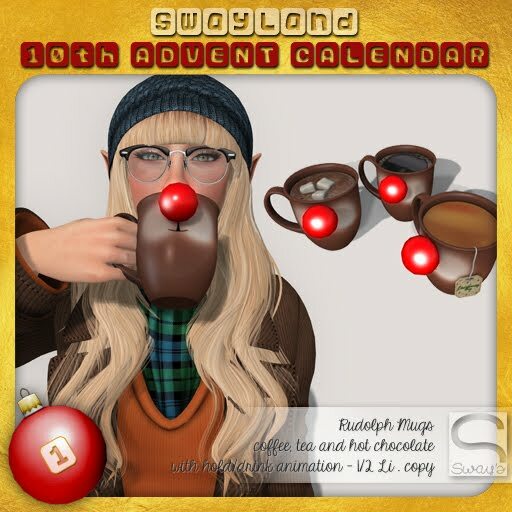 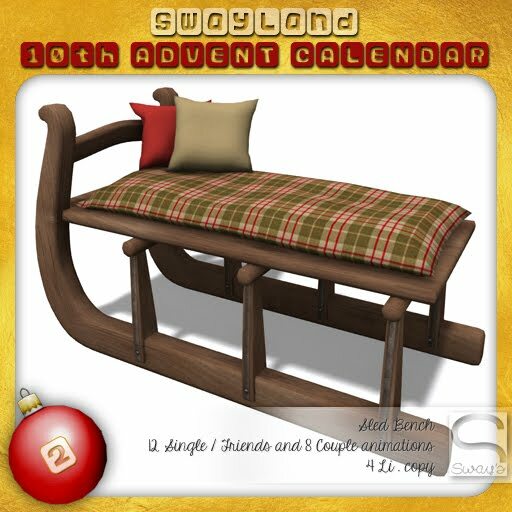 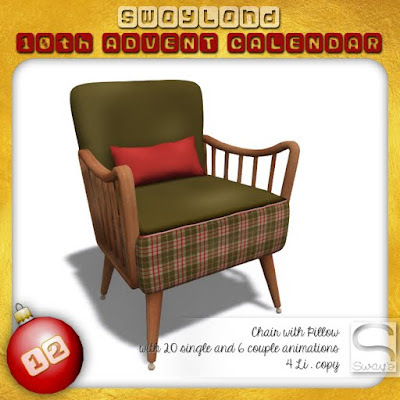 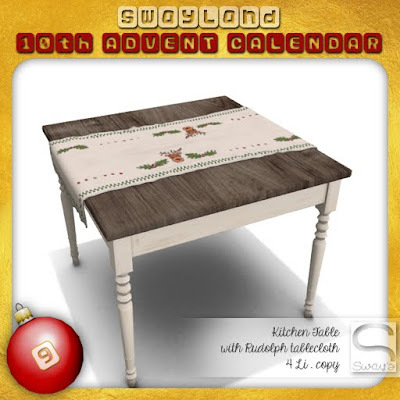 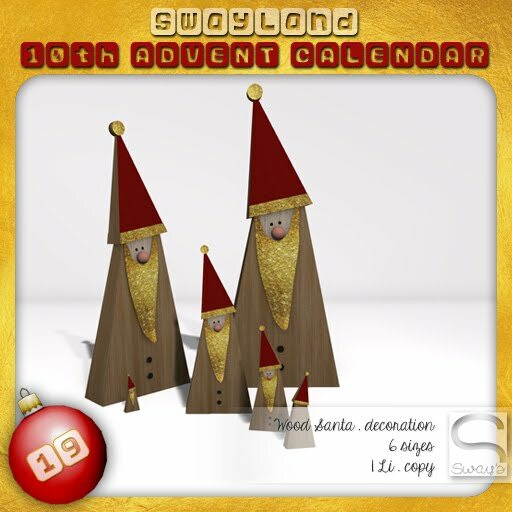 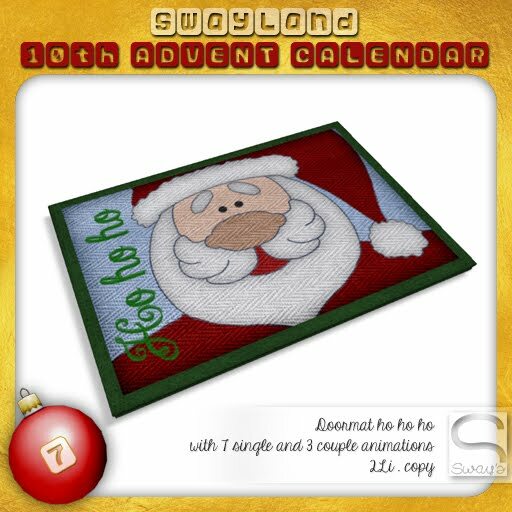 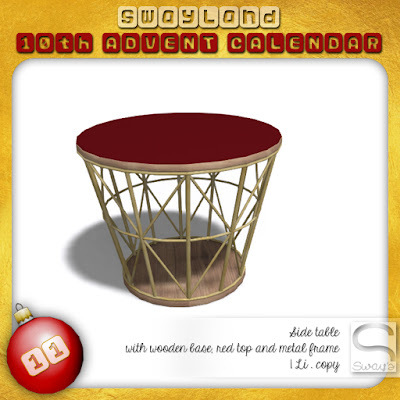 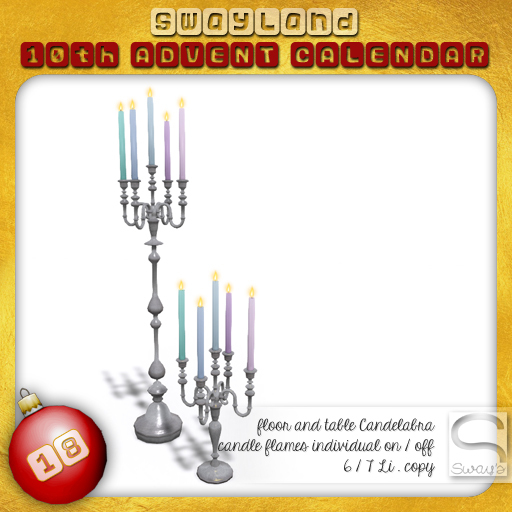 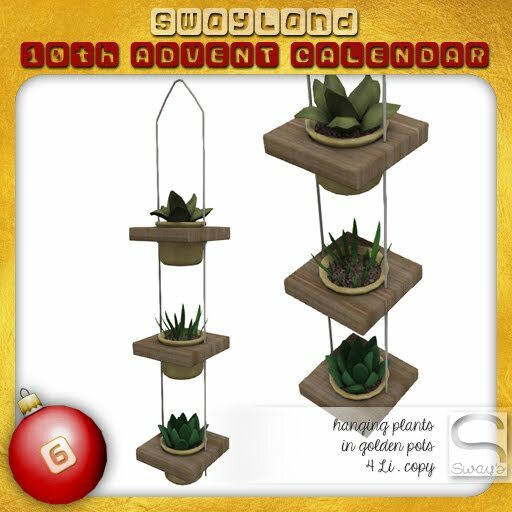 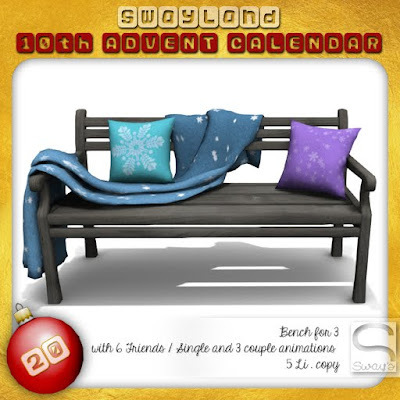 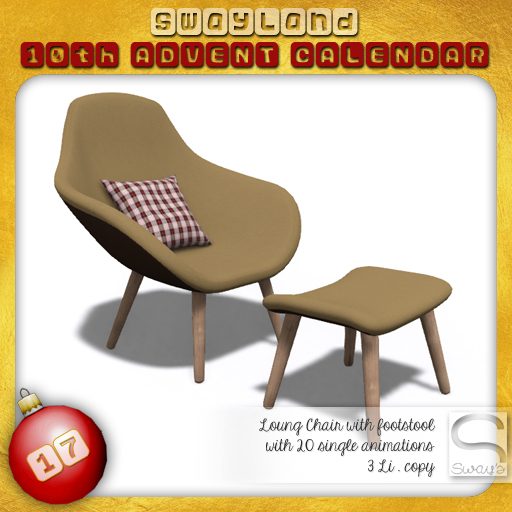 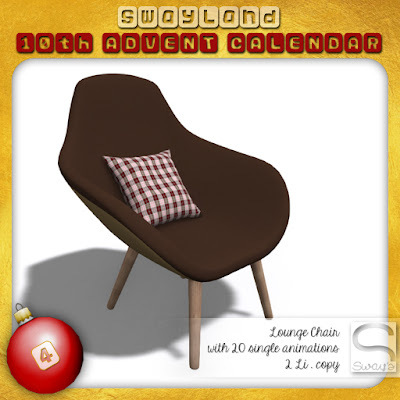 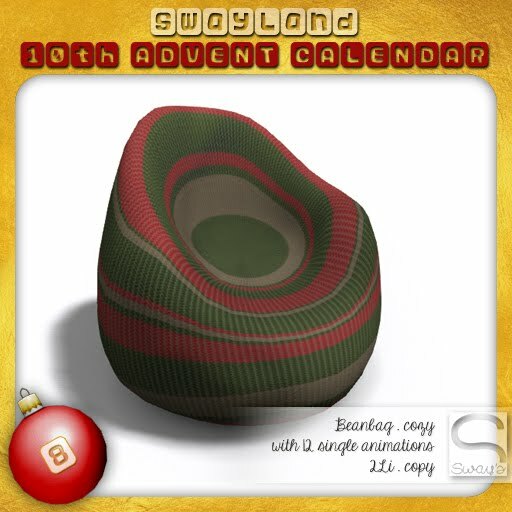 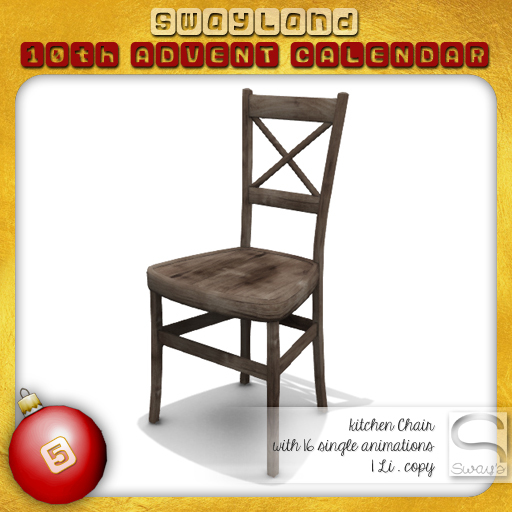 It's the 10th anniversary of the SwayLand Advent Calendar! 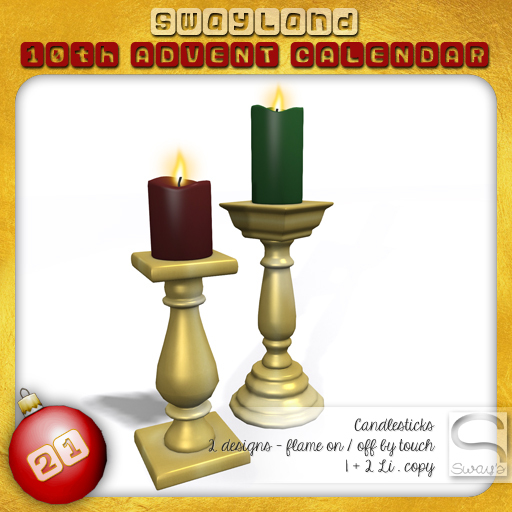 As always there are 24 gifts for the 24 days until Christmas. I hope you like this tradition as much as I do. 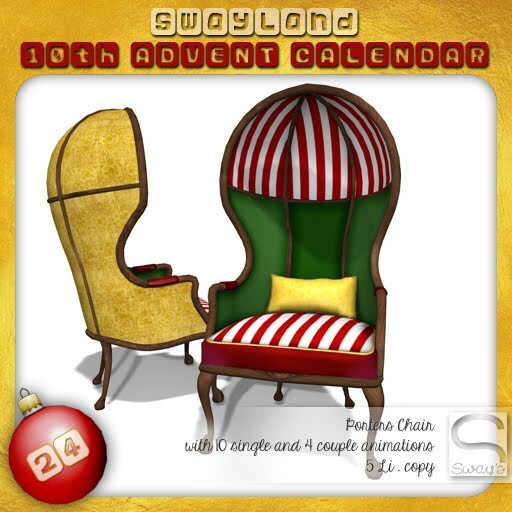 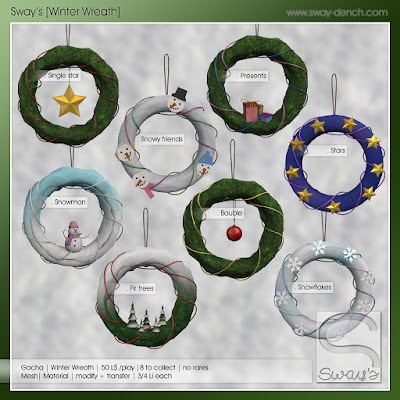 Enjoy the Winter and pre-Christmas time at SwayLand. 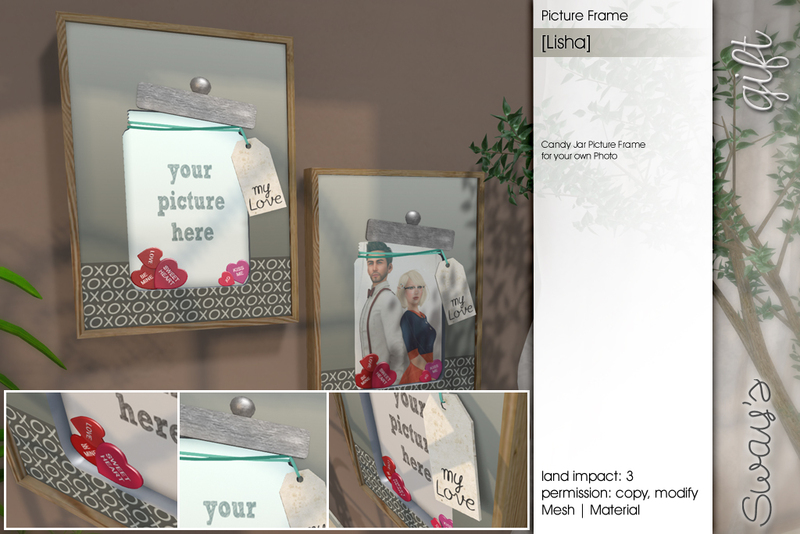 • When you find a Bauble touch it and it will appear on your HUD. 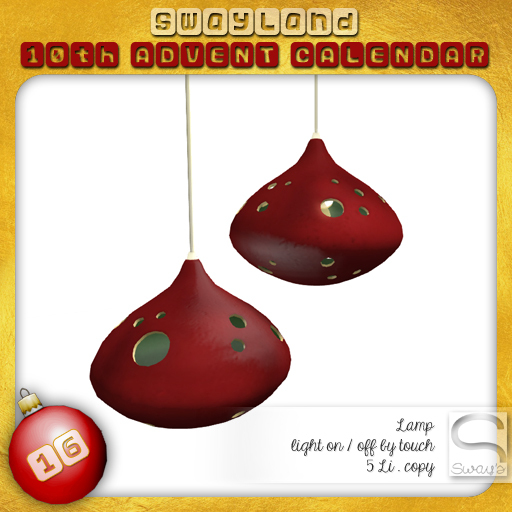 • Once you found a Bauble, it will appear in gold on your HUD with its number. 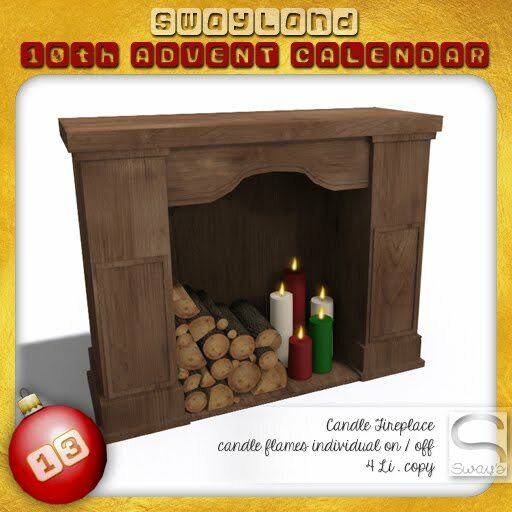 Return to the Advent Calendar, in this case the stack of gift boxes. Touch the giftbox with the correct number on the correct day and get your exclusive Sway's Advent Gift! 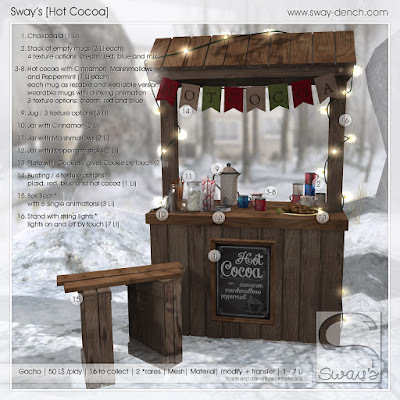 Winter is here and what better than warming up with a hot cocoa. With marshmallows, cinnamon or peppermint sticks. 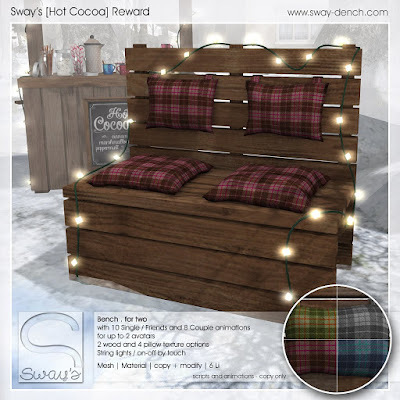 You get them all from Sway's at The Arcade! Exclusive and limited to the Arcade December 2016 is this Reward: Play Sway's Arcade Gacha Machine 25 times and this cozy Bench is yours! 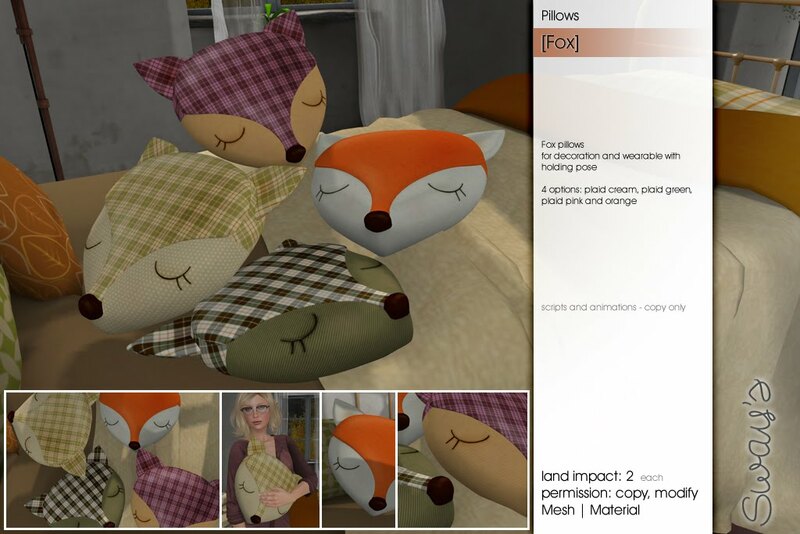 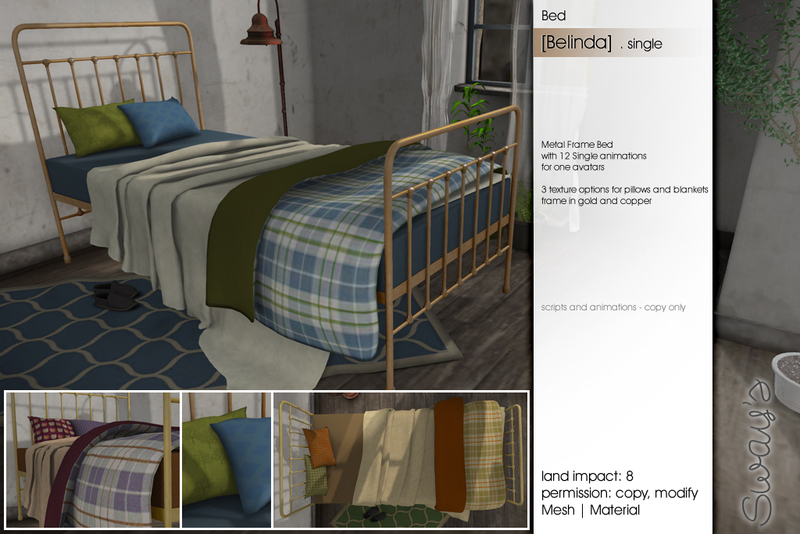 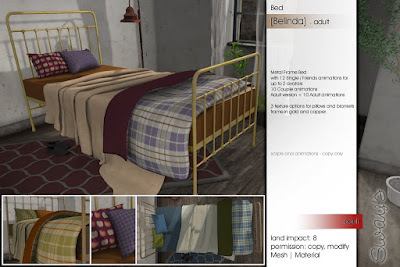 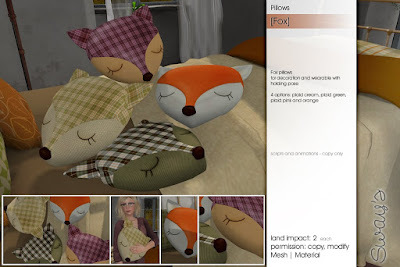 [Fox] Pillows & [Belinda] Bed / Single for today's FLF! 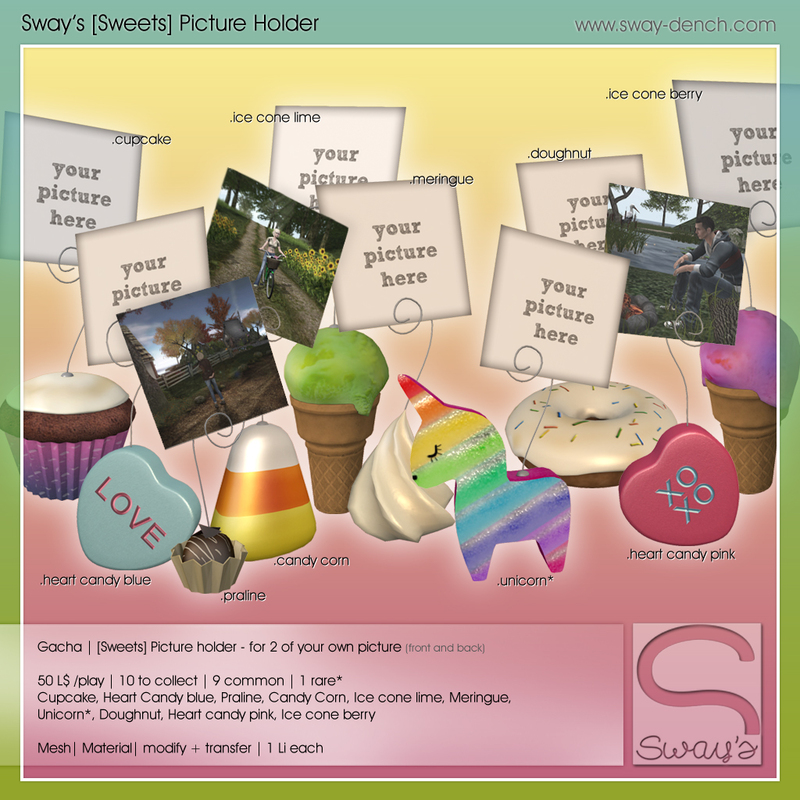 and color matching metal frame. 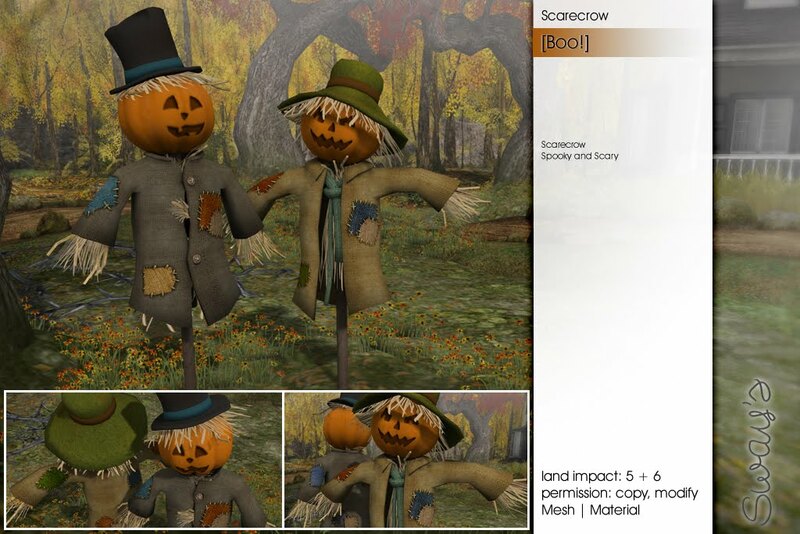 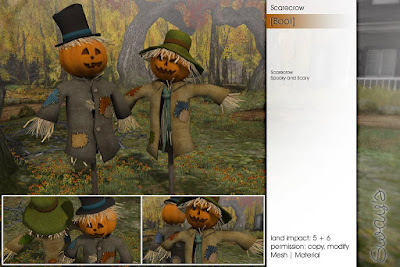 2 Scarecrow with Pumpkin head and burlap clothes. 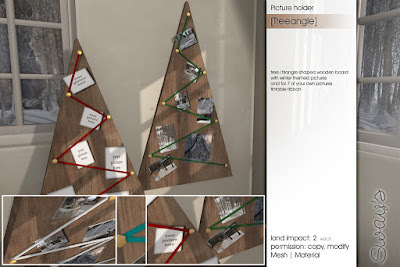 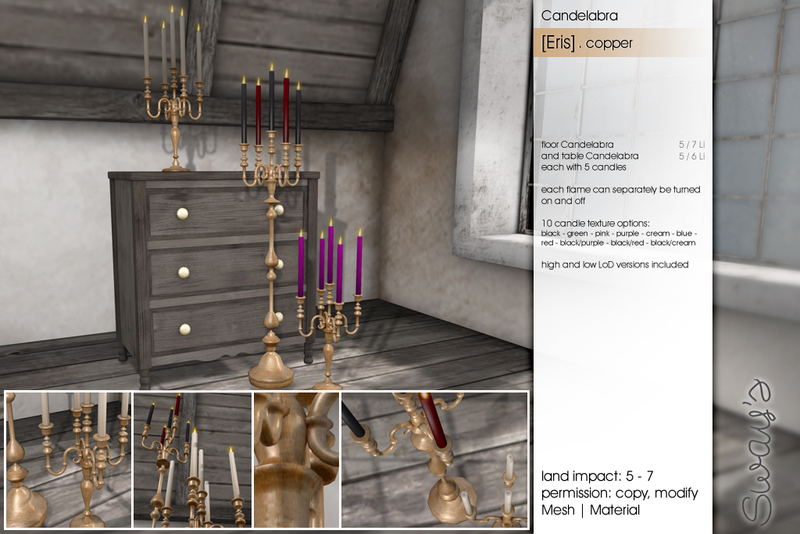 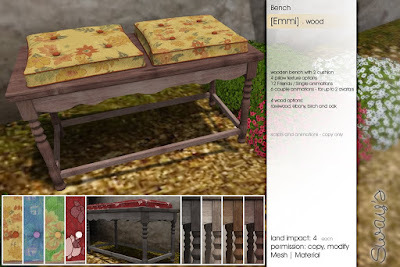 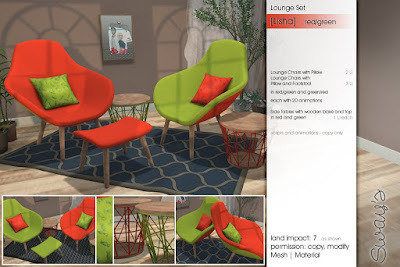 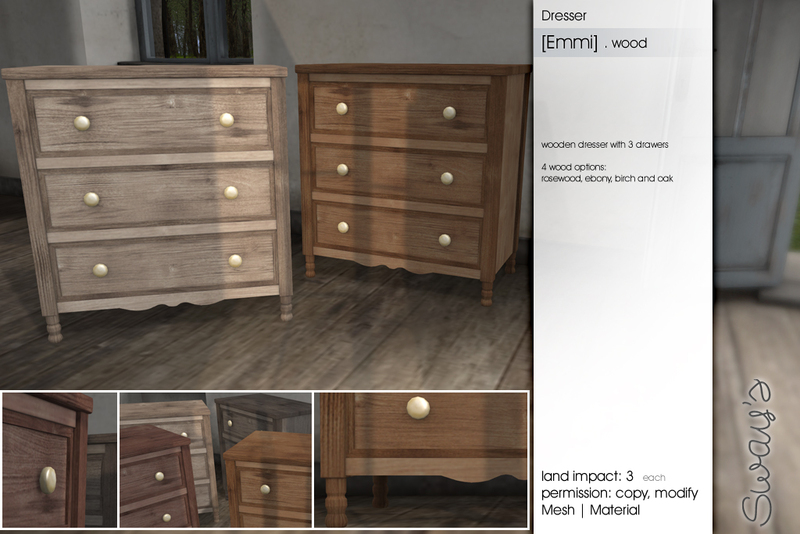 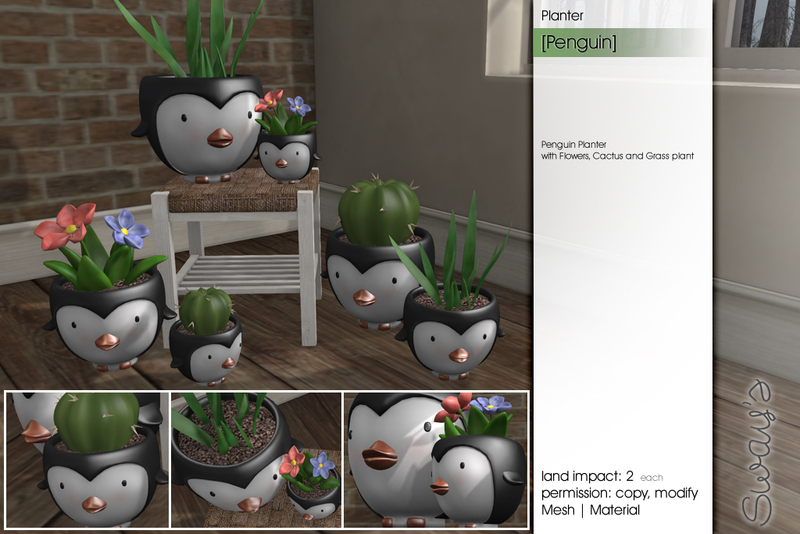 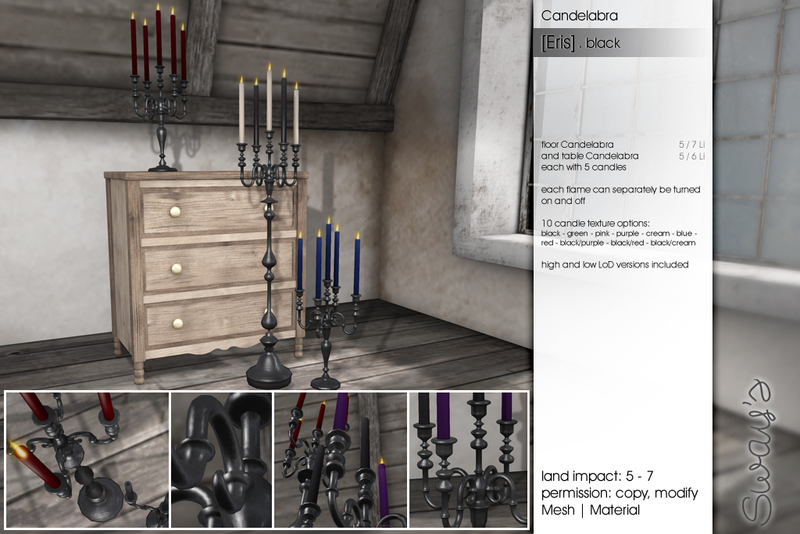 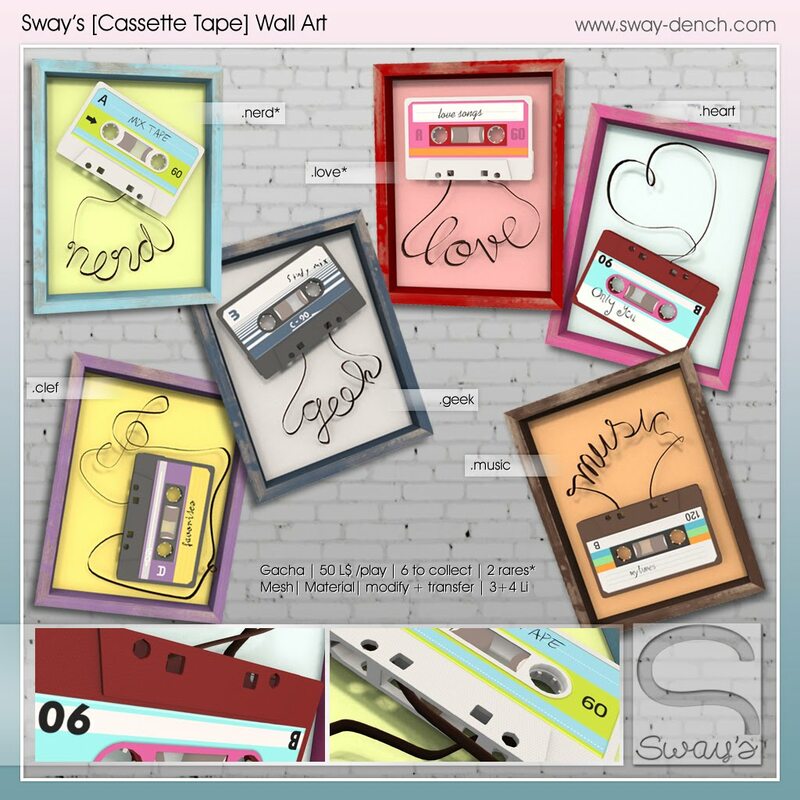 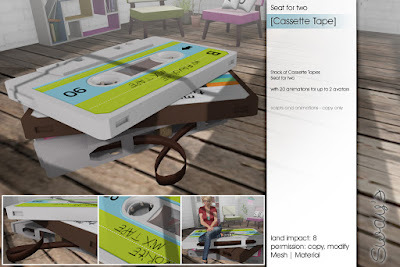 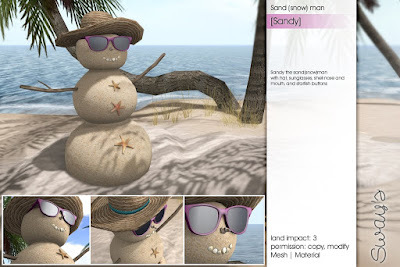 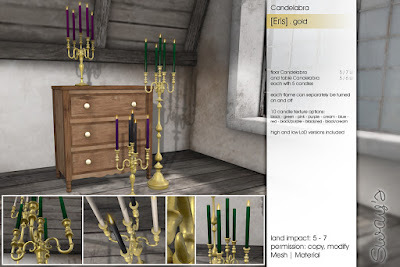 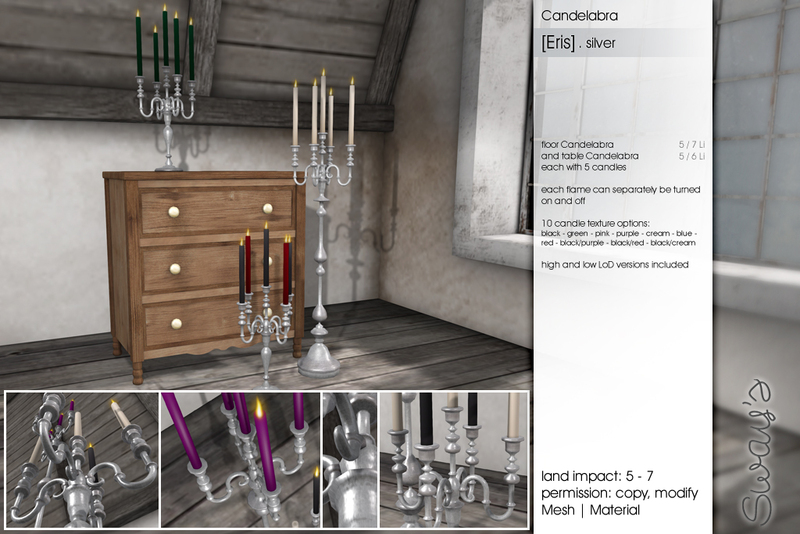 It's Fifty Linden Friday and I have 2 new Items for you.